Plants ca. 6 m. Stems to ca. 20 cm diam., bark green to gray or brown, leaf scars prominent, smooth. 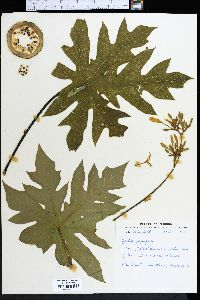 Leaves drooping proximally, erect or spreading distally; petiole 35-70 cm, hollow; blade round in general contour, 20-60 cm diam., shallowly to deeply palmately 5-9-lobed, lobes lanceolate to ovate, margins entire or pinnately divided into lanceolate to ovate lobes. Inflorescences 15-60 cm; bracts ± rhombic. Staminate flowers sessile; calyx green, short-tubular, ca. 1.5 mm, teeth triangular to linear; corolla white, 2-3.5 cm, lobes narrowly oblong, ca. 1.3 cm; stamens yellow. Pistillate flowers subsessile; calyx yellow, short-tubular, 5-10 mm, teeth triangular to linear; petals lanceolate-oblong, white to pale yellow, 3-5 cm; ovary ellipsoidal to rounded, 2-3 cm . Berries hanging from trunk near summit, green to orange, ellipsoidal to oblong, rounded distally, 8-45 cm. Seeds blackish. 2n = 18. Flowering and fruiting year round. Disturbed areas, waste places, hummocks, roadsides; 0-100 m; introduced, Fla.; Central America; nw South America; introduced also pantropically. 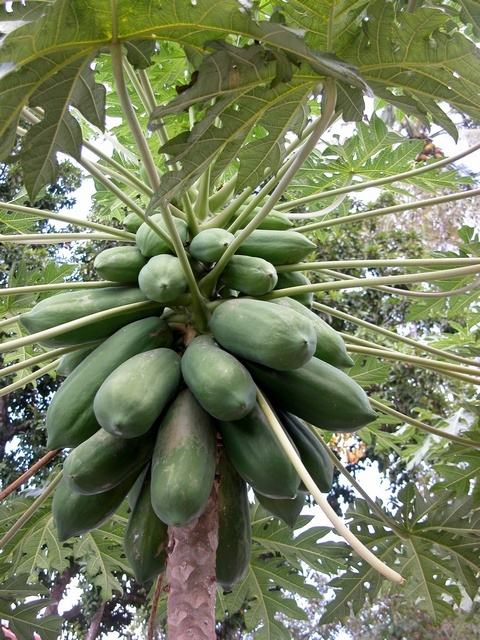 Carica papaya is widely cultivated in tropical regions worldwide for its large melonlike fruit, one of the most popular tropical fruits, and occasionally as an ornamental. Papaya fruit is a good source of calcium, and vitamins A and C. Except for the ripe fruit, all parts of the plant possess a milky sap that contains the proteolytic enzymes papain and chymopapain, widely used to tenderize meat. Immature fruit, leaves, and flowers are also used as a cooked vegetable. Papaya also has industrial and pharmaceutical applications, including use in chewing gums, brewing, drugs for digestive ailments, treatment of gangrenous wounds, use in the textile industry, and use in production of soaps and shampoos. The species is cultivated in extreme southern Texas, where occasional seedlings arise from seeds discarded in waste places or dumps but are never persistent.